Are you sensitive to gluten? Many people are finding that they are, and are looking for foods that can help ease their gluten sensitivity. For those with a gluten sensitivity, digestive problems are the norm. These gastrointestinal disturbances can include gas, abdominal cramps, diarrhea, constipation, and queasiness. But a gluten sensitivity can also trigger headaches and pains. Some find that they feel fatigue immediately after eating gluten. There are also many people that have stepped forward and said that gluten can cause emotional disturbances. These disturbances can include irritability, anxiety, and sudden mood shifts. The medical community doesn’t have a lot to say about gluten sensitivity. In fact, they don’t seem to take it seriously. They do, however, recognize celiac disease, which is a diagnosed allergy to gluten. Despite this, many people are finding that they feel better when they don’t eat gluten. Some people go off gluten altogether while others significantly reduce their consumption. Because of this trend, there is an increasing demand for gluten-free products. Food manufacturers have taken note of the need for gluten-free foods available for purchase in local grocery stores. They have also taken the opportunity to charge high prices for gluten-free products which they market as “specialty” foods. Breads and other goods made with gluten-free flours such as rice flour, buckwheat flour (which, incidentally, has a misleading name as it contains no wheat), corn flour, sorghum flour or chickpea flour are given premium price tags. While these flours are not necessarily more expensive to process, they are definitely priced as such. Some gluten-free breads sell for up to $9.00 a loaf, for example. When talking about bread, there’s also the issue of taste and texture. Many gluten-free breads (rice flour and buckwheat flour come to mind) tend to make a dry bread that crumbles easily. Many gluten-free breads are also heavy and dense. For those wanting an alternative to pricey gluten-free bread, you might want to consider buying sourdough bread. According to a study completed by Italian scientists, sourdough bread contains considerably less gluten than regular wheat bread. 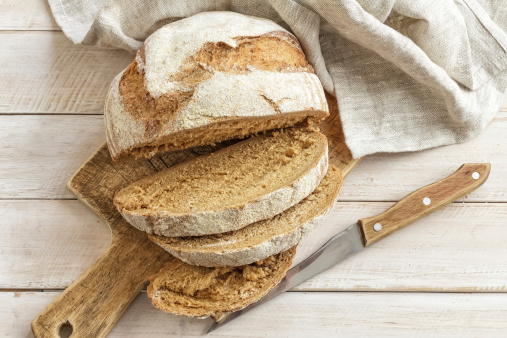 In fact, the gluten content of the sourdough was so reduced that even those with celiac disease who took part in the study were able to eat some of the bread without suffering any symptoms. What is sourdough bread? The dough is made from wheat flour and water, just like any other wheat bread. A sourdough fermentation process is then started. This fermentation process adds lactic bacteria to the dough, which starts to break down the gluten present in the wheat flour. The fermentation process also adds enzymes and gives the bread a distinctive taste. The advantage of sourdough bread is that it has a taste and texture that appeals to most people. The bread is light as it tends to have a lot of holes in the dough and it is also chewy—a big plus for many people on a gluten-restricted diet. Give sourdough bread a try the next time you’re out grocery shopping. Akhtar, K., “Sourdough breadmaking cuts gluten content in baked goods,” CBC News web site, Nov. 11, 2013; http://www.cbc.ca/news/health/sourdough-breadmaking-cuts-gluten-content-in-baked-goods-1.2420209, last accessed Nov. 13, 2013. “Gluten Intolerance Symptoms – How Do You Know If Gluten Is Making You Sick?” Gluten Free Network web site; http://glutenfreenetwork.com/symptoms-treatments/gluten-intolerance-symptoms-how-do-you-know-if-gluten-is-making-you-sick/, last accessed Nov. 13, 2013.